This weekend we are invited to honor those among us who have sacrificed their time, their comforts, and untold other opportunities available to them, even their own physical, emotional and spiritual comfort, so that our world can meet real threats to our security and freedom. Daily I am privileged to serve among men and women in the Church whose character and generosity of spirit was somehow shaped and strengthened by their time in one of the service branches of our military. Lord, our God, look favorably on all those who have served this nation in our armed forces. We thank you for your presence with them in their service. Help them and us to remember their fallen comrades, that the sacrifices we honor this day may never be forgotten. Let the light of liberty and the love of justice and mercy burn brightly in the heart of this and all nations, through Jesus Christ our Savior. O God of all the living, lead us from death to life, from falsehood to truth. Lead us from despair to hope, from fear to trust. Lead us from hate to love, from war to peace. Let your peace fill our hearts, our nation, our world, through the Prince of Peace, Jesus Christ. At this Convention, we focus on three elements of our life together--three aspects that give shape and structure to how we become more and more the Episcopal Branch of the Jesus Movement here in New Hampshire. The three foci are these: Renewing the Faithful; Revitalizing the Church; Reconciling the World. They could be seen as three posts of a trellis that allow us to better tend the vital and vibrant Vine of Christ’s love and presence in this Church and in the world. Let’s start with “Renewing the Faithful.” This theme speaks to how we renew and refresh our relationship with Jesus Christ. By Renewing the Faithful we mean how are we once again commit to being disciples of Jesus, learners, and students of the Rabbi Jesus. The first step to learn about Jesus is to go to the Bible, so let’s look at this morning’s gospel as a way to focus on our own renewal and discipleship. A scribe approaches Jesus with a question. This is a test. There’s a division in the society that has infected the religious community with division. What is the greatest commandment? The scribe is asking in order to settle a political dispute between two competing groups within the Jewish religious environment. (Kind of like now). The division between the Pharisees and the Sadducees are not unlike roughly similar to the liberals or conservatives, the high church party or the evangelicals, viewers of MSNBC or Fox News. In the time the Gospels are written, the culture is under tremendous strain. (Kind of like now) The temple has already been destroyed by an Emperor afraid of losing his grip on global prestige and power. Religious practices are in decline (Kind of like now). The occupying empire at best tolerates, but still constantly demeans the spiritual values of the Jews who are not accustomed to being in exile in their own land. (Kind of like us.) There may have been no lawn signs, bumper stickers or t-shirts that said Don’t Tread on Me or Resist—The Romans would not have tolerated those expressions of free speech. But the effect of the religious and political division was the same: the weight of hatred, mutual suspicion, mistrust, fear and anger made the Jewish people, our ancestors in the faith, pin their trust in a Lord who was above Caesar, a Sovereign whose power was infinitely more merciful and loving, liberating and life giving than the Emperor’s. I don’t like to use the phrase this is what was like “in Jesus’ day” as those “in Jesus’ day” refers to a time over 2000 years ago. Because this, 2018 is as much Jesus’ day as it was when these gospels were written. And this place, this Granite State, is as much the Holy Land where Jesus’ walks and teaches and is rejected, executed and raised from a granite hewn tomb to live with us and show us the way of love, liberation, life, as it was in 1st century Palestine. This is Jesus’ time. This is the place of Jesus. God knows people are forgetful and distractible. Almost throughout the Episcopal Church of NH, when I ask about their faith journey of our members, they might tell me, “You know, I felt I was closer to Jesus once, but it feels like a long time ago.” They share that they are not comfortable talking about Jesus, even with their best friends. It’s probably no surprise, but if you were to compare the amount of time how much time we spend focusing on our buildings, and the survival of our congregations, in contrast to time spent in prayer, or sharing our storieds of how God showed up for us on any given day, the contrast would be stark. I want to tell two stories on myself that illustrate how a religious leader is not immune to this spiritual distractibility. Two weeks ago, we heard from one of our more public figures who happens to be a faithful Episcopalian. Supreme Court Justice Sandra Day O’Connor (an appointee of President Ronald Reagan). As she declared that due to her increasing dementia she would be withdrawing from public life, she pleaded for the restoration of civility and respect in our political culture. And God have mercy, I hope we are all working and praying for a spiritual and moral renewal in or society. Her appearance two weeks ago reminded me of my own personal memory of this leader and to many mind, American icon. Some years ago, I sat on a board of trustees at my seminary, and we decided to award Justice O’Connor with an honorary doctorate in recognition for her faithful service to both Church and Society, as judge, public legal intellectual, and member of our Church. It was a privilege to get to meet her. On the day of the ceremony, we had a chance to sit around the table with her and to ask her whatever we wanted. I remember asking her about some aspect of the Constitution. She paused and then said, “Hold on.” She reached into her modest black purse and pulled out a dog-eared, worn out, well-creased copy of the U.S. Constitution, the same one I was given by the ACLU. (A good stocking stuffer, by the way). The Trustees, made up mostly of lay leaders, priest, deacons and bishops of the Church, chuckled, amused that a seasoned Supreme Court Justice would have her Constitution in her purse. Our own discipleship was questioned, and we were taken to school. Our salvation, the liberation of our world from the oppression of sin, hatred, fear, will not come from our political parties, my brothers and sisters. This is neither the Democratic or the Republican party at prayer. We are the body of Christ, and as such, the aim and purpose of the Church is to learn and know the teachings of God which point us to the love of Jesus, who points us to the renewal of the life that God longs for all people, indeed for all creation. It’s time for us to renew our commitment to meet Jesus again for the first time. That’s done together. In small groups. Jesus called twelve disciples, as foolish and selfish and clumsy as they were, because it was in community that they learn. Small groups of bible study, gathering in homes for meals and prayers, Advent or Lenten quiet days, reading passages from Isaiah, the prophet of Advent before meals during the days before Christmas, congregations undertaking a full reading of the Bible in the next year, or two years. I am so grateful for the leadership of Tina Pickering, our Canon for Ministry development, who, in tandem with the Commission on Ministry, invites us to our call to become learners, to be humble enough to say we want to know more, to learn more, from the Bible, and from each other what is the Good News for the present age. We love our churches, we are committed to social engagement, we are strong in programs of outreach, community engagement and compassion, but we feel spiritually tired, disconnected, our awareness of God and confidence in our discipleship is flagging. If sometimes we feel like we are another Town Meeting but with hymns, is it any wonder why our attendance is depressed...and by that, I mean lower in numbers, but also low in joy? I actually see these statistics as good news. Troubling, sure. But think of the invitation God is giving us! God is troubling our waters. We get to rediscover, again, as though for the first time, the absolute joy that comes from loving Jesus, and learning again, what it can be to be utterly cleared of our sins, to experience the freedom that comes when you take your troubles to Jesus whose love and presence is stronger than even death on the cross. We get to learn how to pray together, without shame or fear. It’s time for revival, and awakening. In fact, come May, St. Christopher’s Hampstead, and St. Peter’s Londonderry, churches that are themselves experiencing revivals of their own, are going to be offering a real revival event, taking the lead of our Presiding Bishop’s preaching and revival circuit around the country, to follow the Way of Love. It’s time to get our Bibles marked up together, to joyfully and freely ask questions like: When Jesus heals the blind man, but instead of seeing clearly, he sees things like trees walking, what’s up with that? Sometimes even Jesus has to start again. So, what’s in your pocket or pocket book? How do you learn the joy of Jesus, in this time of Jesus? If our discipleship, our learning is like our inhale, our breathing in the love of God, and our apostleship, our being sent to be Christ in the world like our exhale (we need to do both to live) How are you learning about Jesus now? Let’s take 5 minutes to turn to a neighbor and share with each other how you are a disciple, a learner, a student of Jesus? Benge Ambrogi, our Canon for Mission Resources, Steve Baker, the Chair of the Mission Resource Commission, the Rev. Gail Avery, the Canon for Transition and Community Engagement, and I were privileged to be invited to join a small group of dioceses whom the Episcopal Church Foundation see as demonstrating a willingness to be innovators and entrepreneurs for Jesus. We in New Hampshire appear to be getting a reputation for asking a troubling question. Why? Why do we have 46 congregations, some of whom are within a short distance of each other when the cost of keeping these buildings and staff going actually impedes our following the Commandment to Love God and our neighbor? Why? Why keep a food pantry or a thrift ship open when the leadership is exhausted and the source of deep conflict in the parish? Why do we run a parish fair when it just leads to more burnout and people don’t see the love of Jesus anymore? Why? Disruptive, troubling question, but one that can lead to love, liberation and life. Just like at the Red Sea. As your bishop for the past 6 years, I don’t want to be complicit in the suffering of our people when we feel that we just have to keep the lights on, the roof on, if these things don’t lead us to be the Jesus movement. The bishop is not Pharaoh, demanding that we make more bricks with less straw. St John’s Church, Dunbarton, and St Stephen’s Church, Colebrook, are discovering ways to come alive again with lay leadership. Assisted by neighboring or retired clergy, preaching and officiating of Morning Prayer are offered by lay leaders. And behold, as newcomers hear about their new life, they find that they are called to use their talents and gifts for the life of the community. As it turns out, this is exactly how many of our churches first were established. Christ Church, Portsmouth and Trinity, Hampton, have recently undertaken a thorough study about their partnership which was renewed last week when I visited them. They are showing signs of new life as they are forming partnership with non-profits that care for both the elderly and children in their neighborhoods. Newport has a lay pastoral leader, Aaron Jenkyns, working in tandem with St Andrew’s, New London where the youth of Newport are invited to sing and share in the service and in 4-H activities every week. Plymouth House, a rehab facility, every Monday, hosts Eucharistic community among those in rehabilitation and recovery from addiction. In God’s eyes, the communion table at Plymouth House is as valid as our most established parish. There is real movement for a new partnership for worship and mission in Plymouth, Ashland, and Holderness School. The Church of St. Jude’s in Franklin, long-boarded up has been recently emptied, cleaned out, perhaps ready for a new mission that might work in partnership with whom? What might it look like? Church in the same old way, or perhaps something more organic that springs out from the neighborhood itself? What is God up to there in this church named for the patron saint of lost causes? The Commission on Ministry is now exploring a more robust practice of Lay Licensing. Imagine a community that gathers for prayer, led by a lay leader, trained and supported by the diocesan office, commissioned by the bishop Morning Prayer, with a sacrament conveyed from a neighboring parish by licensed lay leaders, and licensed lay preachers, with deacons assisting the bishop in the training and support. I suspect we might see a similar revitalization, a renewal as we are seeing in places like Dunbarton and Newport. So leading with the troubling question “why,” why do we have convocations? What if the convocation themselves supported the discipleship, local and regional training for Hub and Spoke missions that could bring the gospel message to those who are not able to come on Sunday morning? I’m interested in exploring how we use our current structures to revitalize and modifying or eliminating them if they are not furthering God’s mission but are just doing the same thing while expecting different results in our mission. Our budget will reflect more and more our becoming the Jesus movement, each year decreasing our Fair Share so that more resources can be kept local, for our missions to be nimbler and more willing to experiment with new forms of worship and proclamation of the Gospel. As I head into a refresher leave this year, I want to pray with this question. Is the “why” of our activity about living into the love of Jesus, or is it about something else, and if so, why are we doing it? What brings life, and what is simply a distraction? What are the measures of our vitality? Is it just average Sunday attendance, or average weekly attendance? I’ve heard other dioceses pick up in the notion of Average Weekly Encounters (AWE), but how exactly do we measure that AWE. How do we measure the joy that Jesus yearns is to be complete in us-- joy, that sense of confidence in God’s goodness and love toward us, even when all external evidence might say otherwise? The team I mentioned in the beginning, Benge Ambrogi, Steve Baker, Gail Avery and I are working with the Episcopal Church Foundation to come up with another dashboard to measure the vitality, and life of our congregations and our Church. We’ll be soliciting input from you in the coming year. When do you know you are alive, when the love of Jesus is pulsing through you, guiding and supporting you, surrounding us, reknitting us together in love for the healing of our world. What makes you alive? How do you know you’re alive in Jesus? So, let’s take another five minutes and ask the question to a different neighbor. What makes you feel alive in Christ when you are in Church? Where is the Holy Spirit troubling the waters within you and within your congregation, making you restless or hungry for more? On any given day in the Church of New Hampshire, we are pursuing God’s mission to heal the world. I am so glad to have welcomed the Rev. Canon Gail Avery to help coordinate these efforts, and I just want to highlight a few. The Earth Care Commission is seriously exploring how our churches can turn from dependence on Fossil Fuels to using our roofs and parking lots and open land into solar farms that could actually help light and warm the neighborhoods where our churches have been planted for the benefit of those neighborhoods. The Commission is working on “Third Party” financing in which a third-party investor takes the tax advantages of the solar array. All Saints’ Church in Wolfeboro installed a 25 kW solar array. These 184 solar panels have now been in operation for 2 full years and produces approximately 85% of their electricity needs. These efforts could actually bring clean light and power to the neighborhoods while addressing Global Climate Change. The River of Life Pilgrimage of a summer ago has actually replicated itself in other waterways and diocese around the country, offering opportunities for people to reconnect with Jesus Christ, the one who was present at the Creation and who today calls us to repent from our using the earth as an object to be exploited. The Church of the Woods’ reputation grows beyond our borders and has actually spurred a movement of environmental spiritual start-ups from here to the west coast. The Church of New Hampshire took a lead this past Lent in providing prayers and pilgrims who walked the Black Heritage Trail, learning of the Granite States part in our country’s sins of slavery, institutional racism and racial reconciliation. This coming Good Friday, a Stations of the Cross incorporating the Black Heritage Trail will take place in Keene. As the Opioid Crisis continues to take more casualties in our state. We grieve this epidemic and the fact that this scourge has affected, if not someone we know directly, then someone within our circle of friends, family, workplace, or church neighborhood. I am proud of the work that the Rev. Sandi Albom as the Convener of Recovery Ministries, and our own Rev. Jason Wells, Executive Director of the New Hampshire Council of Church, and Deacon Shawn LaFrance whose work on the senior management team of the Cheshire Medical Center in Keene are forming partnerships with other denominations and faith traditions along with the State’s efforts to activate its Hub and Spoke plan to bring swift and effective treatment to the addicted. We continue to be concerned about the widening opportunity gaps for children and youth that threaten the stability of our society. Some children have every chance to succeed and to grow intellectually, physically, emotionally and spiritually. Many other children fall prey to the risk of damage when parents are absent, negligent, or abusive. Some find themselves at more risk of addiction. These are our kids, because we are children of God, they are our brothers and sisters. This Church has gained a reputation for addressing their needs, and for getting to know who they are, as persons worthy of our care, our love. The resolution from the Our Kids Commission urges each of our parishes to live out the commandment to love our neighbor as ourselves... to welcome the children in our neighborhoods into our midst, through mentoring, tutoring, through offering innovated worship, simply by crossing the street to support athletics or afterschool activities that require fees that price out students whose parents cannot afford them. I am convinced that supporting the health and well-being of children, both in our churches and outside, where they see adults act in kindness, generosity, and respect, is the antidote to the growing toxicity of our times. It’s the place of greatest leverage for us, and I hope and pray God may lead us to be more present to kids, all kids in our state. It has been rightly noted that the remedy to our torn social fabric will probably not come from our political structures and institutions. The events of the past several years have shown us how our neighborhoods have been less neighborly and more just pods of isolated households that don’t know or care for one another. And yet, we come together, week by week, sometimes more often than that, welcoming strangers into our midst. That’s the gospel way. That’s the way of Jesus. That’s the way of love. I pray that we, Tending the Vine that connects us all in Jesus Christ, may live out our high calling of love and reconciliation, rooted more and more in our love and knowledge of Jesus, in this time and place, and find our life renewed. So, let’s take another five minutes and seek a third neighbor, preferably one you don’t know very well. How are you sent into the world to be a part of God’s mission to reconcile and heal the world? In what way, small and quiet, or big and bold, are you being a part of God’s healing of the world in this troubled time, this time of Jesus? A memorial service is planned for Saturday, October 6 at 11 am at Union Church, Claremont. May Jesus, the Good Physician, welcome Charlie into his embrace with the words, “Servant, well done.” And please hold Marthe and their family in your close prayers. The Rev. 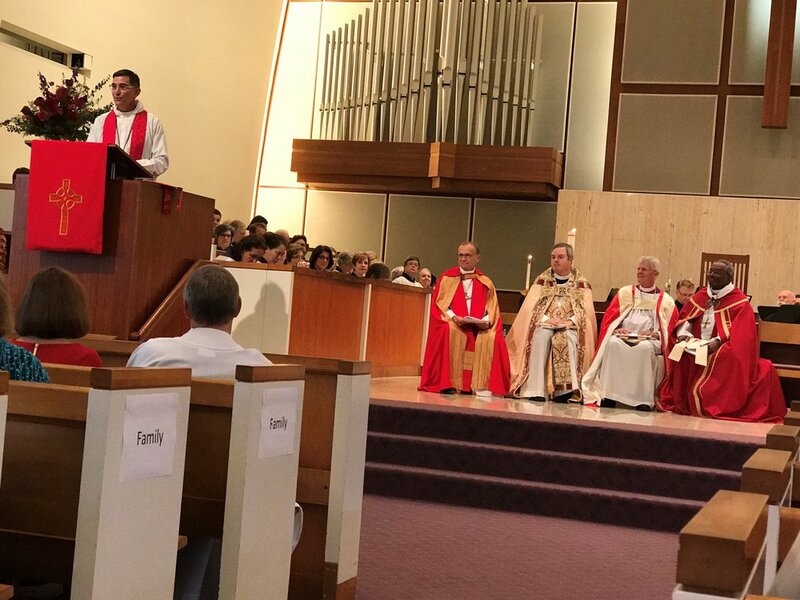 Canon Kevin Nichols was ordained as the IX Bishop for the Diocese of Bethlehem on Saturday, September 15, 2018. A summary of this glorious day can be found HERE. Pray on September 12-13 for Death Penalty repeal in New Hampshire. The NH Senate and House of Representatives tomorrow may override Gov. Chris Sununu's veto of SB593. See NH Council of Churches website nhchurches.org for recommendations for prayer and meditation. About that time again!!! The Wood-Pawcatuck River Pilgrimage begins tomorrow. The Manchester NAACP Annual Freedom Fund dinner is September 29, 2018. The theme this year is "We Who Believe in Freedom" and the keynote speaker is Debby Irvine. For more information, click LINK. Wonderful article in the Union Leader, featuring the Rev. Sandi Albom, discussing addiction and faith. Click HERE for article.